This month’s installment is a real treat--two for the price of one. Because John and Nancy Wilson are inseparable, they preferred to be interviewed together. Nancy Wilson was born in Milwaukee. She has been collecting coins since she was seven years old. Nancy and her brother’s involvement in collecting coins was a result of their father’s occupation. He was in the jukebox business, and would bring lots of change home. Nancy and her brother would look through it and try to find one coin of each date. They didn’t know much about coin collecting, but they used the family dining table to spread the coins out on and to sort them. Later on they started going to a jewelry store in the neighborhood that actually sold coins. Nancy’s mother found it when taking the bus one day, as she didn’t drive. She suggested to her husband to take the children there to find out the value of their coins. Both Nancy and her brother are very involved in collecting. Nancy is most interested in paper money. John Wilson was also born in Milwaukee. He was a paper boy until he went to high school. He remembers that he and his friends would play with quarters, dimes, and nickels that today might be rare, in the back alley next to the paper station. They would take turns tossing them toward the wall, and the closest would win. This, of course put a lot of dings and scratches in the coins, but the boys didn’t know that some day these coins might be very valuable. In contrast to his wife, John did not really become interested in collecting coins until he married Nancy. At the time, he was employed by the Wisconsin Air National Guard in Milwaukee. John served in the U.S. Marine Corps from 1962-1966, which included a tour in Vietnam. After a short engagement, they were married in April 1968, and began attending coin shows together. In the early 1970s, John “fell in love” with large-sized paper money. It didn’t take long to become interested in all areas of numismatics. Both of them are avid collectors of U.S. paper money, tokens and medals (especially Wisconsin), porcelain coins and medals, ancient coins, autographs and other items. John and Nancy recently celebrated their 40th anniversary. Since they don’t have children, John says they like to consider ANA members as their “kids.” John himself was ANA President from 2001 trough 2003. 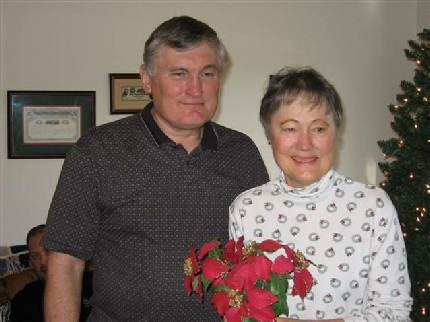 Both John and Nancy served a total of 18 years on the ANA Board (1987-2005). Both have numerous mentors. One is Nancy’s brother, Chuck Opitz, who has been an ANA member for close to 50 years. Others who are members of the Milwaukee Numismatic Society are A. P. “Del” Bertschy, Gail Highsmith, and Walter J. Boeyer. All were gifted numismatists, but no longer with us. Two other important mentors of theirs are Ken Bressett and Neil Shafer. Some advice from Gail Highsmith, that John would like to pass along, is to become specialized. “Become an expert in one area and learn all that you can about it.” Thanks to this advice, John and Nancy now specialize in Santa Clause banknotes and stock certificates, and have assembled type sets of their other specialties: obsolete $3 bills from every state, Colonial and Continental Currency, and Banks of the U.S. They also specialize in Wisconsin collections of: Civil War tokens, obsolete notes, checks, tokens and medals and railroad stock certificates. Nancy used to attend coin shows with her father and brother when she was too young to drive. As she got older, she joined the Milwaukee Numismatic Society. She has been a member of MSNS since the 1980s. Both she and John have exhibited at many MSNS shows, and have won numerous awards. In her earlier days, winning Best of Show for an exhibit of paper money at the Milwaukee Coin Society show was the inspiration that made her continue exhibiting her collections. Her main purpose in exhibiting is to share her knowledge with other people. Both of the Wilsons have served on numismatic boards, both locally, regionally and nationally. John served as president of the Central States Numismatic Society. He also served on board on the Society of Paper Money Collectors and the International Bank Note Society. Nancy served on the boards of the Florida United Numismatists and Numismatists of Wisconsin. Both are members of many coin clubs around the country. (John mentioned belonging to around 80.) Between them, they have many years of service in many coin clubs. John served as general chairman of the ANA’s 100th Anniversary Convention in 1991. The event was attended by over 21,000 people at the Rosemont/O’Hare Exposition Center in Chicago. John and Nancy both served as General Chairs for the 1990 CSNS Convention in Milwaukee. Over the years, John has received numerous awards. Among honors presented by the ANA, he was the recipient of the 1993 Glenn Smedley Memorial Award and the 1994 Medal of Merit. John received the National Silver Dollar Roundtable (NSDR) Man of the Year in 1998. Nancy also received numerous awards over the years. She won the ANA’s Howland Wood Memorial, Best-in-Show Award at the 1984 Detroit Convention. In 1995, Nancy received the ANA Glenn Smedley Award, and in 1997 the ANA Medal of Merit. Nancy received the NSDR Woman of the Year Award in 1997. Both received the ANA President’s Award in 1998. Krause Publications awarded John and Nancy with the coveted Numismatic Ambassador Award in 1990. They also received FUN’s A.J. Vinci Memorial Award for Excellence in Numismatic Education in 1998, and the NSDR’s Lifetime Achievement Award in 2005. In 2007, the Society of Paper Money Collectors awarded them their Medal of Merit. John and Nancy also received the Elston G. Bradfield CSNS Literary Award in 1981. The Wilsons’ most recent honor was being chosen for the Farran Zerbe Memorial Award, which is the highest honor conferred by the American Numismatic Association, in 2007. They mention that it was great to receive this high honor in Milwaukee at the Hilton Hotel, right across the street from the convention center. Both John and Nancy are certified ANA judges and assist with judging at many conventions around the country. They have also exhibited at many coin shows around the country. John and Nancy have assisted at numerous Young Numismatists and Scout Merit Badge Clinics over the years. They are very proud of working hard for the ANA as National Volunteers. In this capacity, they have been the “high member recruiters” for the past several years. As was mentioned earlier, the Wilsons are deeply involved in numismatics. They stress that they like to help others get involved in coin collection and encourage others to exhibit. They also like to tell new as well as old collectors to buy the book before the coin. Nancy enjoys telling about how her father and brother used to go to the local coin store while she stayed home with her mother. Her father bought a 1931-S cent for her brother and of course a duplicate for her. At that time it cost $1.45. When he brought them home, her mother looked at the coins and said, “What! You paid $1.45 for that penny? They saw you coming. You’re nuts. That’ll never be worth $1.45.” Those involved in coins today know that it was a very good buy. Both Nancy and her brother own that coin to this day. Nancy added that she is really happy that there are YN programs today for young collectors, something that didn’t exist when she was growing up. Children, she says, need to become involved in a hobby. Most of them have too much free time on their hands. After retirement, the Wilsons moved to Ocala, Florida, where they live today, in a retirement community. Their time is devoted completely to numismatics. John recommends to other collectors to become involved in a local coin club. Then get involved with the state organization, followed by regional and then national coin clubs. The ANA has over 500 coin clubs, and some of them deal with an area of the hobby that you might be interested in. Go to www.money.org and under the coin club listing, you will find the clubs that might help to advance you in your areas of interest. I want to add a small tidbit. If you are on the Wilsons’ email contacts list, you can expect, like clock work, to receive an American Greeting E-card--every single holiday, with the sign-off: YINAF (Yours in Numismatics and Friendship) John and Nancy. Thank you, John and Nancy, for your dedication to the hobby.